Experience counts when building a plan. It applies to financial plans as well as landscape plans. Successful planning integrates hindsight and foresight to achieve a specific set of goals. Essentially, we want our entities to grow, provide us with enjoyment and not become a burden. A sustainable landscape plan will properly address downspouts, drainage, setting, soil, style, tolerance for weeds and budget. A well-seasoned and knowledgeable landscape designer/contractor will plan for a landscape that protects the family and home from harm allows for future growth, and can be enjoyed physically, mentally and spiritually by all who utilize the space. Each yard and family has unique challenges and opportunities, but the baiv principles of proper planning always apply. It is important to recognize potential threats before they do costly damage. Design the downspouts to outlet the water where it is needed and not near the foundation. The gutters can be connected to a flexible, perforated pipe that is wrapped in a permeable sleeve and laid out around the garden beds to slowly irrigate the plants. Make sure to have an open outlet at the end to eliminate clogging. Rain gardens are a great addition to home landscapes. They address drainage, help provide localized flood control and encourage healthy habitats for butterflies, bee pollinators and a great variety of birds. Rain gardens differ from retention basins because the water infiltrates the ground within a day or so, which does not allow mosquitoes to breed. The geographic location of a property determines the setting and existing soil. It is difficult to change the terrain of a yard, but it is possible. In most cases the setting of the house on its property is accepted. The design is created around its challenges. The topsoil can always be amended if soil tests show any deficiency in nutrients or harmful contaminants. 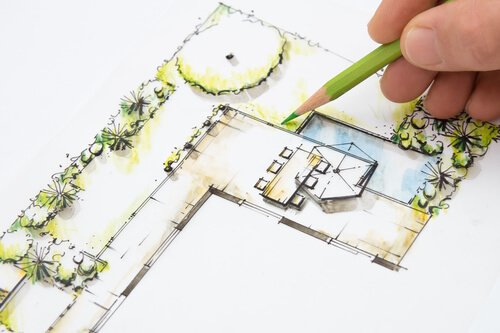 A quality landscape plan addresses the style of the home as well as the client’s preferences. It is the designer’s task to balance the plan to achieve both. A good designer will provide native plants that grow with low maintenance, maintain a safe distance of trees shrubs from around the foundation of the home, and build a great looking, long lasting landscape. A successful plan can offer ground covers to reduce weeds over time, or it can call for heavy-duty landscape fabric and mixed size gravel to eliminate weeds from the beginning. The budget will determine whether a project can be completed all at once or in phases. It is the duty of the designer to achieve success, through successful planning.